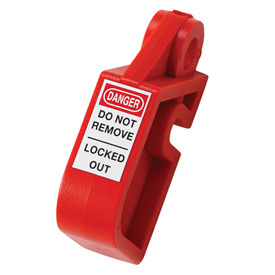 OSHA requires employers to establish a Lockout Tag out program and use procedures for affixing appropriate lockout devices or tag out devices to energy isolating devices, and to otherwise disable machines or equipment to prevent unexpected re-energizing, start up or release of stored energy in order to prevent injury to employees. 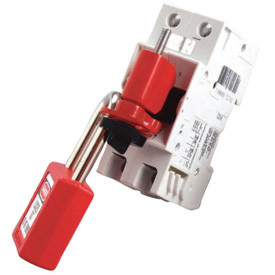 A mechanical device that physically prevents the transmission or release of energy, including but not limited to the following: A manually operated electrical circuit breaker; a disconnect switch; a manually operated switch by which the conductors of a circuit can be disconnected from all un grounded supply conductors, and, in addition, no pole can be operated independently; a line valve; a block; and any similar device used to block or isolate energy. Push buttons, selector switches and other control circuit type devices are not energy isolating devices. 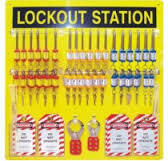 Lockout: Lockout is one way to control hazardous energy. The placement of a lockout device on an energy isolating device, in accordance with an established procedure, ensuring that the energy isolating device and the equipment being controlled cannot be operated until the lockout device is removed. 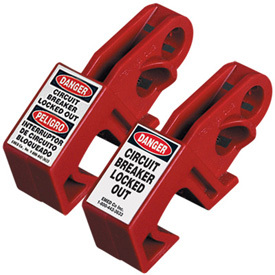 Lockout device: A device that utilizes a positive means such as a lock, either key or combination type, to hold an energy isolating device in the safe position and prevent the energizing of a machine or equipment. Included are blank flanges and bolted slip blinds. Tag out: Tag out is a labeling process that is always used when lockout is required.The placement of a tag out device on an energy isolating device, in accordance with an established procedure, to indicate that the energy isolating device and the equipment being controlled may not be operated until the tag out device is removed. Tag out device. 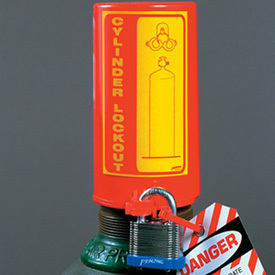 A prominent warning device, such as a tag and a means of attachment, which can be securely fastened to an energy isolating device in accordance with an established procedure, to indicate that the energy isolating device and the equipment being controlled may not be operated until the tag out device is removed. The OSHA standard covers the servicing and maintenance of machines and equipment in which the unexpected start up of machines or equipment, or release of stored energy could cause injury to employees. 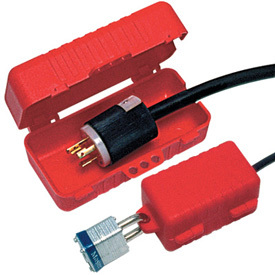 Work on cord and plug connected electric equipment for which exposure to the hazards of unexpected start up of the equipment may be controlled by the unplugging of the equipment from the energy source and by the plug being under the exclusive control of the employee performing the servicing or maintenance. Each Authorized Employee must have and use their own locks & tags – these must be uniquely identifiable as lockout-tag out material and be identified to the specific worker. LOTO Procedure for all equipment. Each Authorized Employee issued separate locks & tags. Locks & Tags are standardized . Use Locks & Tags only for LOTO. Locks & Tags have identification of who placed them. Only the person who placed the lock may remove it . 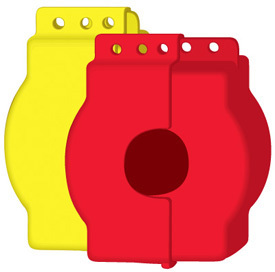 Safety devices such as barrier guards or guarding devices are installed on systems to maintain worker safety while these systems are being operated. 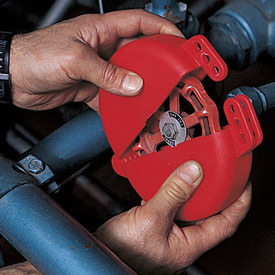 When non-routine activities such as maintenance, repair, or set-up; or the removal of jams, clogs or misaligned feeds are performed, these safety devices may be removed provided there are alternative methods in place to protect workers from the increased risk of injury of exposure to the unintended or inadvertent release of energy. 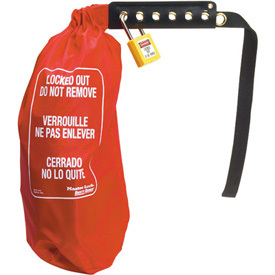 The main method used and recommended to protect workers from risk of harm in these cases is the use of a lockout/tag out program (LOTO). By exposure to an electrical arc. Hydraulic potential energy is the energy stored within a pressurized liquid. When under pressure, the fluid can be used to move heavy objects, machinery, or equipment. Examples include: automotive car lifts, injection moulding machines, power presses, and the braking system in cars. When hydraulic energy is released in an uncontrolled manner, individuals may be crushed or struck by moving machinery, equipment or other items. Pneumatic potential energy is the energy stored within pressurized air. Like hydraulic energy, when under pressure, air can be used to move heavy objects and power equipment. Examples include spraying devices, power washers, or machinery. When pneumatic energy is released in an uncontrolled manner, individuals may be crushed or struck by moving machinery, equipment or other items. Chemical energy is the energy released when a substance undergoes a chemical reaction. The energy is normally released as heat, but could be released in other forms, such as pressure. A common result of a hazardous chemical reaction is fire or explosion. Radiation energy is energy from electromagnetic sources. This energy covers all radiation from visible light, lasers, microwave, infra red, ultraviolet, and X-rays. Radiation energy can cause health effects ranging from skin and eye damage (lasers and UV light) to cancer (X-rays). Gravitational potential energy is the energy related to the mass of an object and its distance from the earth (or ground). The heavier an object is, and the further it is from the ground, the greater its gravitational potential energy. For example, a 1 kilogram (kg) weight held 2 metres above the ground will have greater gravitational potential energy then a 1 kg held 1 metre above the ground. Mechanical energy is the energy contained in an item under tension. For instance, a spring that is compressed or coiled will have stored energy which will be released in the form of movement when the spring expands. 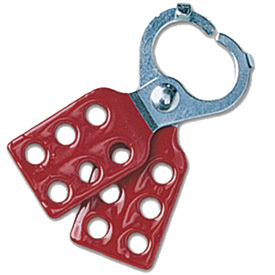 The release of mechanical energy may result in an individual being crushed or struck by the object. It is important to understand that all of these energy types can be considered as either the primary energy source, or as residual or stored energy (energy that can reside or remain in the system). Primary energy source is the supply of power that is used to perform work. Residual or stored energy is energy within the system that is not being used, but when released it can cause work to be done. For example: when you close a valve on a pneumatic (air) or hydraulic (liquid) powered system, you have isolated the system from its primary energy source. However, there is still residual energy stored in any air or liquid that remains in the system. In this example, removing the residual energy would include bleeding out the liquid, or venting out the air. Until this residual energy is removed from the system, work can occur, whether on purpose or inadvertently. Not properly assessing and dissipating stored energy is one of the most common causes for workplace incidents that involve hazardous energy. Control of hazardous energy includes isolating the system from its primary power source and residual energy. Affected person – is an employee whose job requires them to operate a system, or work in an area in which servicing or maintenance is being performed under lockout/tag out. Authorized person – is an individual who is qualified to control hazardous energy sources because of their knowledge, training, and experience and has been assigned to engage in such control. System – refers to machinery, equipment, or processes. The authorized person will identify which sources of energy are present and must be controlled and more importantly, identify what method of control will be used. This step involves completing sets of specific work instructions that outline what controls and practices are needed to lock and tag out a system before performing any activity. 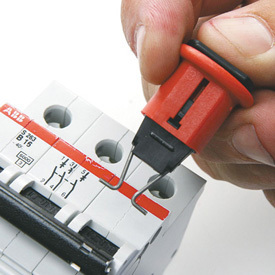 Electrical energy – Switch electrical disconnects to the off position. Visually verify that the breaker connections are in the off position. Lock the disconnects into the off position. 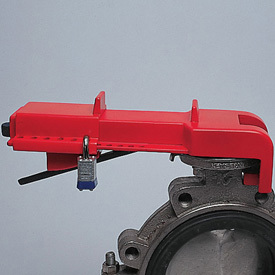 Hydraulic and Pneumatic potential energy – Set the valves in the closed position and lock them into place. Bleed off the energy by opening the pressure relief valves, then closing the airlines. Mechanical potential energy – carefully release energy from springs that may still be compressed. If this is not feasible, block the parts that may move if there is a possibility that the spring can transfer energy to it. Gravitational potential energy – Use a safety block or pin to prevent the part of the system that may fall or move. Chemical energy – locate chemical supply lines to the system and close and lockout the valves. Where possible, bleed lines and/or cap ends to remove chemicals from the system. Electrical energy – To find a specific method to discharge a capacitor for the system in question, contact the manufacturer for guidance. Many systems with electrical components, motors, or switch gears contain capacitors. Capacitors store electrical energy. In some cases, capacitors hold a charge in order to release energy very rapidly (e.g., similar to the flash of a camera). In other cases, capacitors are used to remove spikes and surges in order to protect other electrical components. Capacitors must be discharged in the lockout process in order to protect workers from electrical shock. Hydraulic and Pneumatic potential energy – Set the valves in the closed position and locking them into place only isolates the lines from more energy entering the system. In most cases, there will still be residual energy left in the lines as pressurized fluid. This residual energy can be removed by bleeding the lines through pressure relief valves. Contact the manufacturer for more specific details, or if no pressure relief valves are available, what other methods are available. Mechanical potential energy – Carefully release energy from springs that may still be compressed. If this is not possible, use blocks to hold the parts that may move if the energy is released. Gravitational potential energy – If feasible, lower the part to a height where falling is impossible. If this is not possible, contact the manufacturer for guidance. Chemical energy – If available, bleed lines and/or cap ends to remove chemicals from the system. There should be as many locks on the system as there are people working on it. For example, if a maintenance job requires 3 workers, then 3 locks should be present – each of the individuals should place their OWN lock on the system. Locks can only be removed by those who installed them, and should only be removed using a specific process – see step 9 below. The machine, equipment, or process controls (push buttons, switches, etc.) are engaged or activated and the result is observed. No result means isolation is verified. Return controls to safe position (off). Electrical connections to ensure they are open. 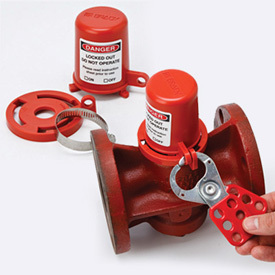 Valve positioning for double block and bleed (for pipes or ducts) – closing two valves of a section of a line, and then bleeding (or venting) the section of the line between the two closed valves. Presence of solid plate used to absolutely close a line – called line blanking (for pipes or ducts). Test circuitry (should be done by a certified electrician) – however, equipment with capacitors needs to be cycled until all energy is drained. 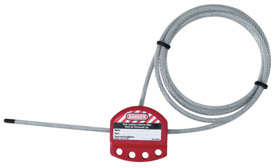 Check pressure gauges to ensure hydraulic and pneumatic potential energy has been removed. Check temperature gauges to ensure thermal energy has been discharged. Choose the method that will best ensure that the energy to the system has been isolated without creating other hazards during the verification. Inspect the work area to ensure all tools and items have been removed. *Note – it is good practice to ensure any individual who placed a lock on the system should also be present when the system is re-started. This practice helps make sure those employees working on the system are not in a hazardous area when the machine is restarted. • Never remove someone else’s lock or tag.